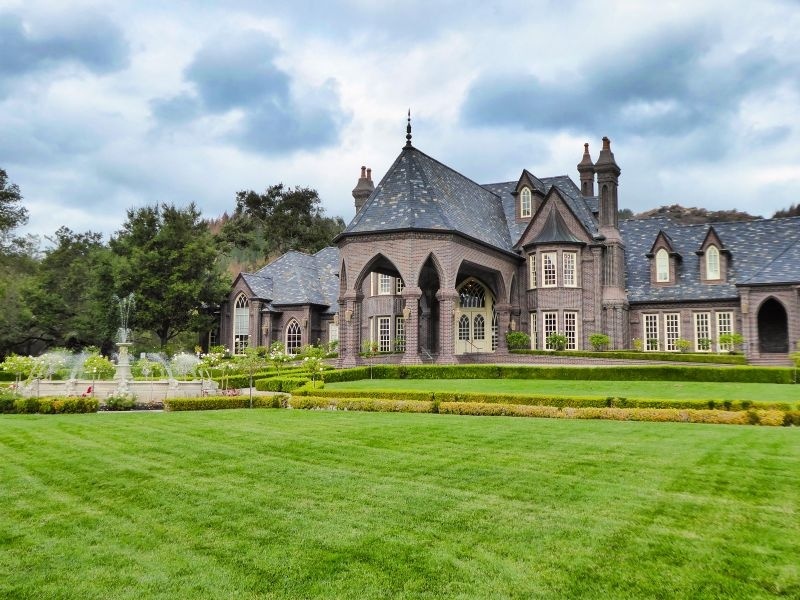 We were staying in Santa Rosa to attend a Wine Bloggers Conference. This was our first visit to Sonoma County since the fires and we had been somewhat nervous that we would see scenes of devastation, but I am happy to report that the drive to Santa Rosa was still one that took us through beautiful hillsides covered in vines. On the Sunday after the conference, we visited Ledson winery, a fifteen-minute drive from Downtown Santa Rosa along the Sonoma Highway. Several of our fellow attendees had tweeted positive notes about the Ledson Viognier at one of the conference’s tasting events, which gave us additional motivation to visit. 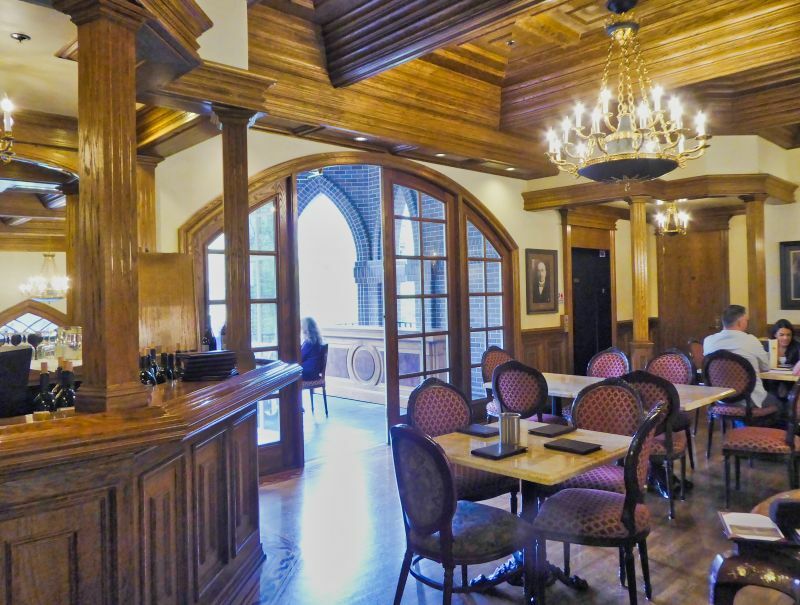 The Ledson tasting room is an imposing structure built in the style of a chateau in the Normandy region of France. 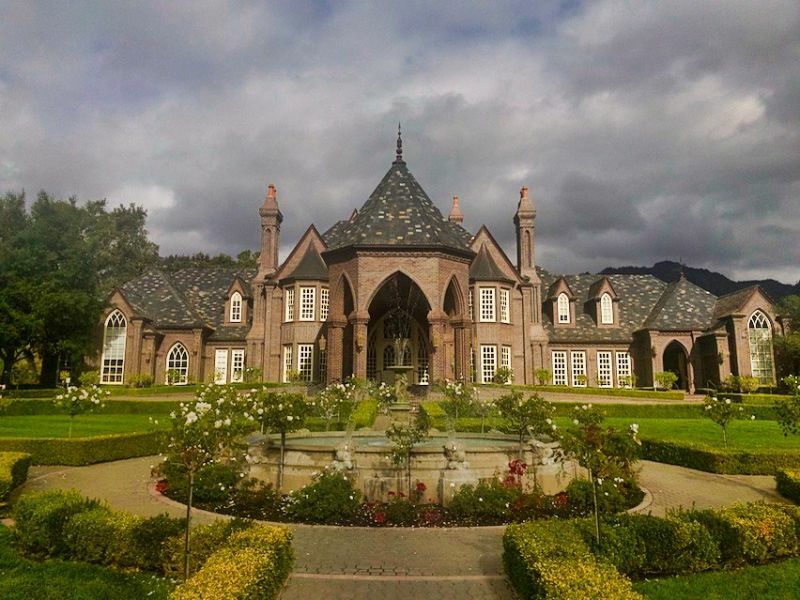 The winery owner, Steve Ledson, had originally planned this castle to be a family home, but the scale and grandeur of the building made him realise that it was better suited to be a tasting room. It opened its doors to the public in 1999. 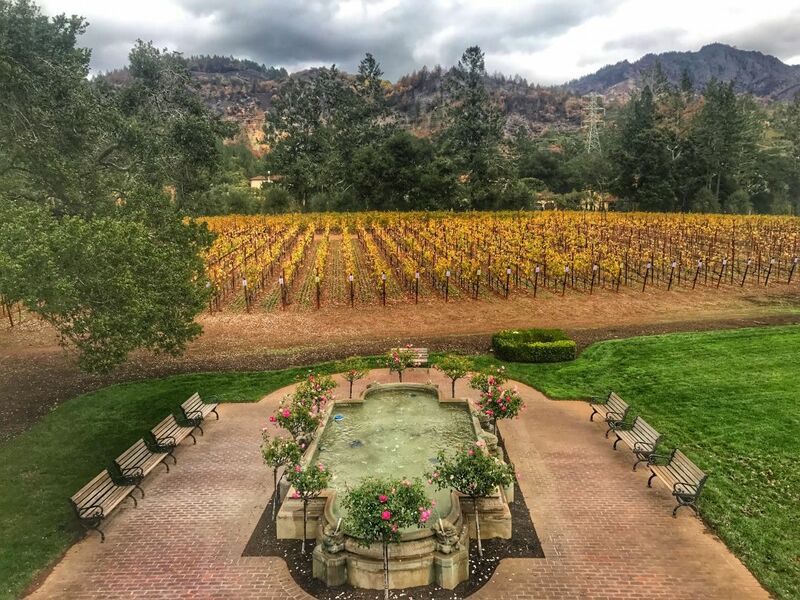 In front of the tasting room are formal gardens with a fountain at the centre. Ledson was threatened by the fires but as you can see from the pictures it is not only open for business, it remains a striking building surrounded by natural beauty. 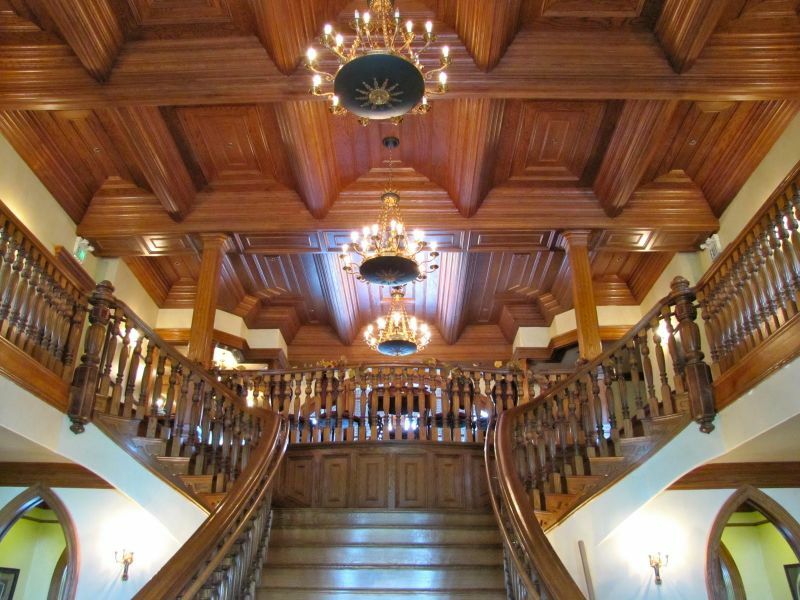 Walking in through the double doors you see an impressive oak staircase that leads up to an open landing that is used for members’ tasting. 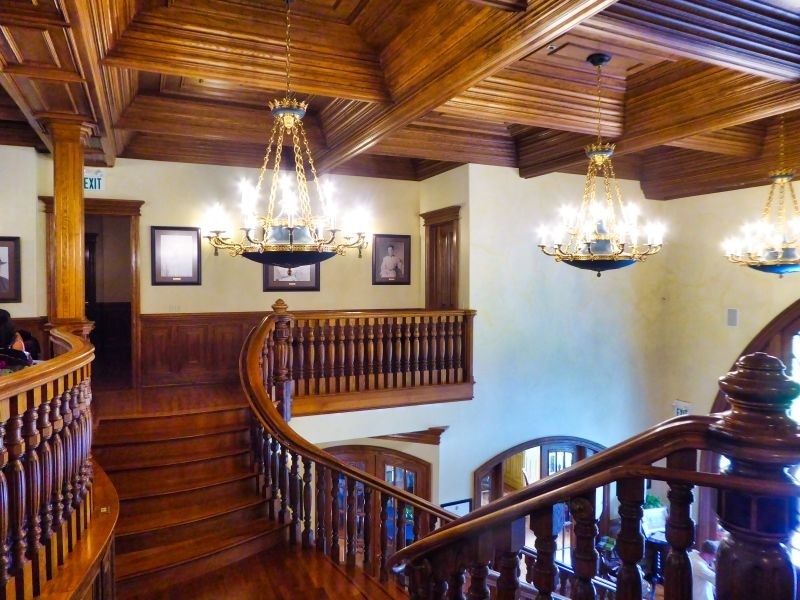 The building makes heavy use of oak on the floors and on panelling. We were fortunate enough to be given the reserve tasting in this beautiful space, sat at a heavy wood table featuring mother of pearl inlays. Our first taste was the 2016 Napa Valley, Sauvignon Blanc. The wine was fermented in 100% stainless steel. It retails for $36 and 1,289 cases were made. The nose was of low intensity, possibly because it had been served a little too chilled. I found aromas of mown grass and rose petals. California Girl comments: I got odors of chicken soup on the nose. First time for everything! Maybe it was because it was an overcast and miserable day when we visited – wishful thinking. Taking a sip, I met a soft mouthfeel with a delightfully complex mix of flavours; grapefruit, Granny Smith apples, orange blossom, and a touch of salinity. The Sauvignon Blanc was light and refreshing with a long finish. This was a delightful way to start our tasting and is a wine that would work as an aperitif or paired with delicate fish. 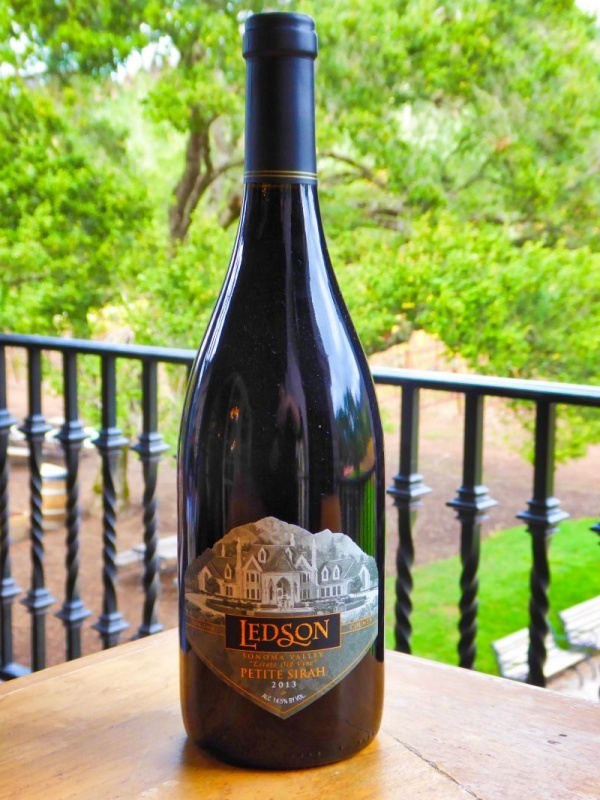 The second Ledson wine that we tried was the Russian River Chardonnay, which had spent fourteen months in French Oak and undergone 100% malolactic fermentation. The wine sells for $44. The nose offered and pineapple and vanilla; once more I suspect the aromas were stifled by the temperature at which the wine was served. On the palate, medium acidity was supported by vanilla, cream, tropical fruit, with pineapple prominent. I have become wary of 100% oaked Chardonnay; having often encountered drinks for which the “under-wined oak” cliche is spot-on. This Chardonnay is an example of how to use oak well; creating a complex and balanced wine. After two bright white wines, it was time to sample some red wine; a more appropriate match for the heavy oak panels and furniture that surrounded us. First up was the 2013 Dry Creek Zinfandel Reserve, of which just 190 cases were made. It retails at $54. The nose was intense and full of promise; with notes of sweet, ripe plums, and dark chocolate. The palate was dominated by chocolate and sandpaper rough tannins in the mid-palate. Fruit in the form of blackberry and plum emerged on subsequent sips. The sweetness in the nose was no-where to be found in the mouth. A medium length finish had an intriguing tension between acidity and chocolate. This felt far more like an old-world wine that a California Zin. Our fourth wine was the 2014 Cepage, a blend of the five noble grapes from Bourdeaux (Cabernet Sauvignon, Merlot, Malbec, Cabernet Franc, and Petit Verdot). It sells for $86. The nose was intense and complex with plum, blackcurrant, and baking spices. Taking a sip, California Girl described it as Thanksgiving in a glass. It is a lush wine with velvet smooth integrated tannins and rich fruitiness. I tasted plum, blackberry, cherry, and cedar. It is drinkable now but should have the potential to age. The fifth wine we tasted was the 2013 Napa Valley Cabernet Sauvignon ($120). 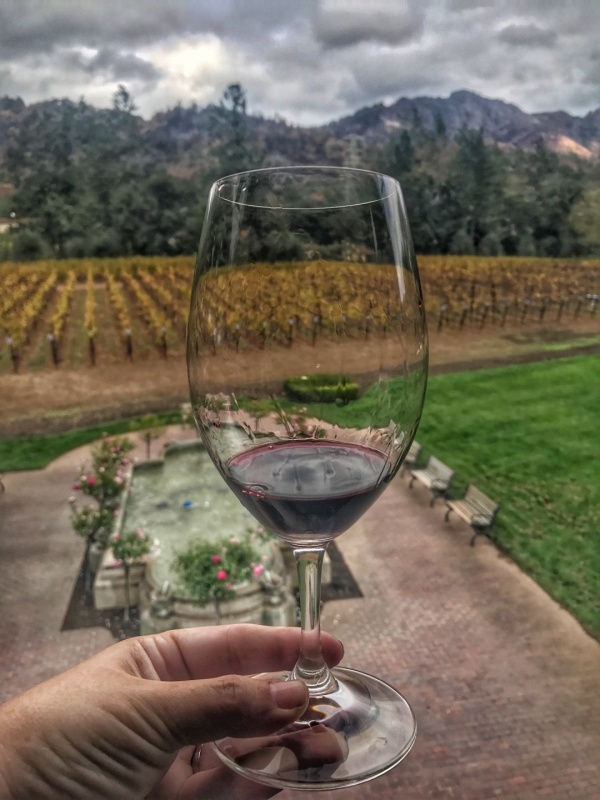 The wine is all mountain fruit; a fifty-fifty blend from grapes grown on Howell Mountain and fruit from the Atlas Peak side of the Stagecoach vineyard. The nose was intense; green and black pepper, moss, and plum lurking in the back. Taking her first sip, California Girl exclaimed “Wow, Delicious!’; this may not represent a typical tasting note, but it is an accurate reaction. I am often asked, how can a winery justify charging over a hundred dollars for a wine; a taste of this provides a perfect answer. Big tannins like velvet coated the mouth, with raspberry, earth, and baking spices flowing all of the way into a long, blissful, savory finish. The next wine and the last on the tasting menu was the 2013 Sonoma Valley Estate Old Vine Petit Sirah, which is priced at $46. The wine was opaque dark purple in the glass. The nose was intense with notes of plum, damp earth, and alcohol. It seemed oddly thin, especially for a varietal usually associated with being big and bold. The flavours were dominated by earthiness and blackberry. I wonder if our impression was tainted by the two phenomenal wines that we just tasted. After tasting we went downstairs to the Ledson gourmet market; where you can purchase the wines you have tasted, as well as assorted culinary goodies and freshly made sandwiches. These sandwiches can be enjoyed in the picnic area that sits shaded by old oak trees. The only caveat is that no outside food or drink can be consumed. I wandered around the building while California Girl ate her sandwich. The building is 16,000 square feet, but this scale is not reflected in the tasting rooms, which are intimate and enable even walk-in guests to enjoy a tasting without feeling crowded. On a November afternoon in which there was a slight hint of chill in the air, fires blazed in the tasting rooms. The friendly atmosphere was accentuated by framed photographs of the Ledson family, chronicling their life in California through the generations. A regular tasting costs $20-$30. The reserve tasting we enjoyed costs $50. 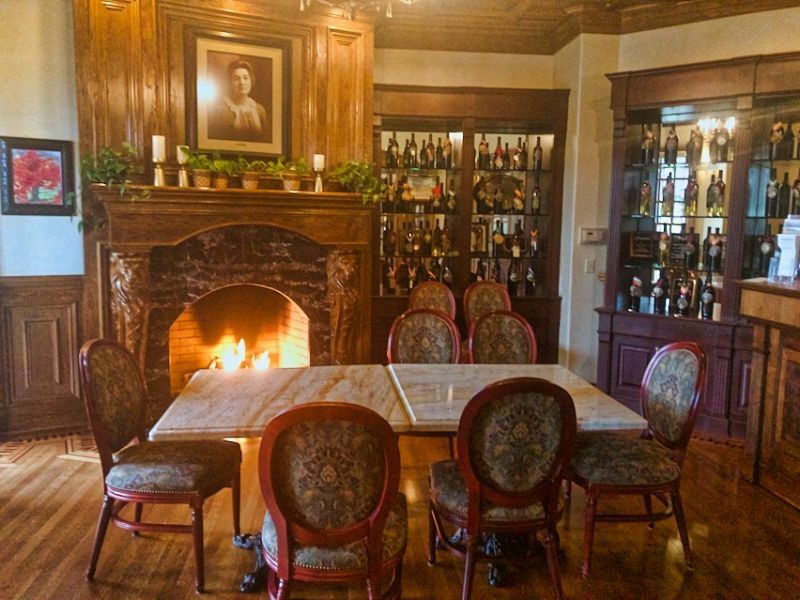 Ledson also offers a private tasting for $75, for which reservations are required. 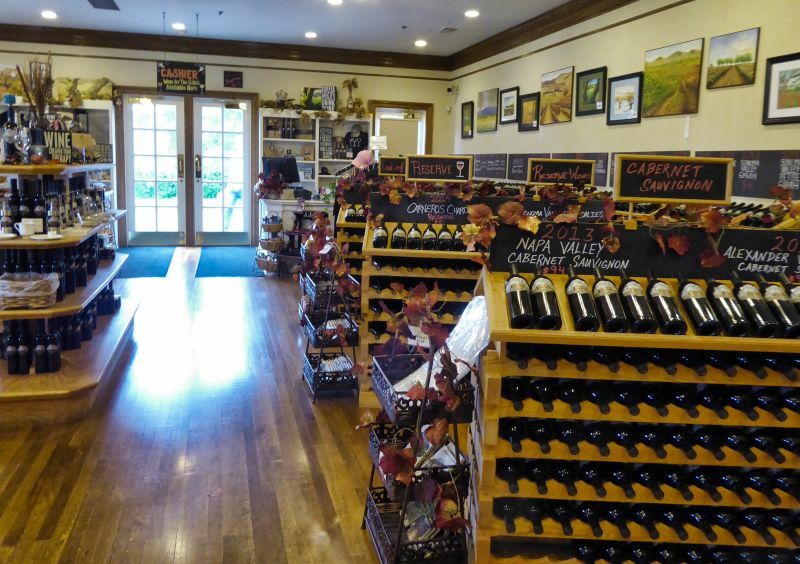 We were impressed by the beauty of the site, the majesty of the building, the friendly staff, and truly memorable wines. 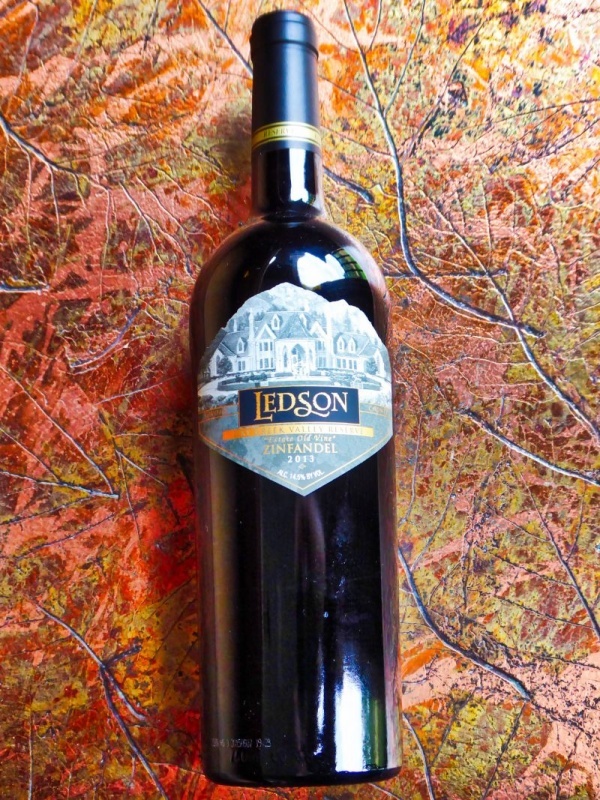 I would highly recommend you add Ledson to your itinerary when you next visit Northern California wine country. It truly is a magnificent building. I was so happy to hear the rumors of it being burned in the fires were just that, rumors. Looks like an amazing winery and the wines sound absolutely delicious, will have to check them out when I return!